‘I’m not serving you!’ When is the customer NOT always right? It is such a compelling debate, that I have decided to get in on the act. Who is in the right, and who is in the wrong? Are they both right? Are they both wrong? The story made me think of the old adage ‘the customer is always right’……..a statement that can spark a new debate all of its own! So let’s explore the questions – was the customer ‘right’ in this situation? Every day, organisations all over the world interact with customers. Customers come in all shapes and sizes. Some customers are very nice, some customers are not. Some customers like to have a conversation, some like to avoid human interaction altogether. Some customers now transact with companies without ever seeing, speaking or touching another human being!! Welcome to the world as we know it in 2013. It is a world of ease and convenience, where consumers are able to do whatever they want, wherever they want to. The sight of a customer walking and talking and eating and drinking whilst doing something on their smart phone or tablet is not unusual in society today. It is not uncommon to see people talking in to a phone whilst tapping away at their tablet simultaneously. Whether it be for work, or for pleasure, our ability and desire to stay connected much of the time has become a fact of life. Hands up if you go to bed with your smartphone sitting within 1 foot of your pillow? What I am trying to say is that Jo Clarke will not have been the first customer to roll up at a checkout in a supermarket with a phone glued to her ear. Jo Clarke is unlikely to be the last – despite the publicity her experience has generated. As technology has evolved over the last twenty years, social etiquette has unfortunately evolved at a very different rate. What people perceive to be acceptable today, they would not have perceived to be so twenty years ago. What Jo Clarke did last week is , in my opinion, rude. What she did though is not technically wrong – there is no policy or law that prevents a customer of Sainsbury’s (or any other retailer as far as I am aware) from conducting a transaction at a checkout whilst at the same time participating in a telephone conversation. There is no policy or law that would have prevented her from having a face to face conversation with another customer or friend at the same time either. However, just because there is no law against it, does not make it socially acceptable to do it. The environment we live in today still contains people – you or I. It is bizarre to think that there are more of us in the world now than there were before these techy whizzy smart phone devices were invented. Yet despite their being more people, we interact in person less and less. That may explain why manners for many have gone out of the window. However, where we do interact with people ‘face to face’, there is no reason why we should pay them any less respect than we would have done a hundred years ago. I feel I am well placed to talk about this subject. Last year, I spent three glorious weeks experiencing life at the beginning of the twentieth century in the BBC programme, Turn Back Time: the Family. Living for a week as an Edwardian middle class local council clerk allowed me to see how important manners, etiquette and social behaviour was. There is no doubt that the overly strict social heirs and graces in Edwardian England were a little rigorous, however as we fast forward over a hundred years to 2013, we may have gone a little far in the other direction. 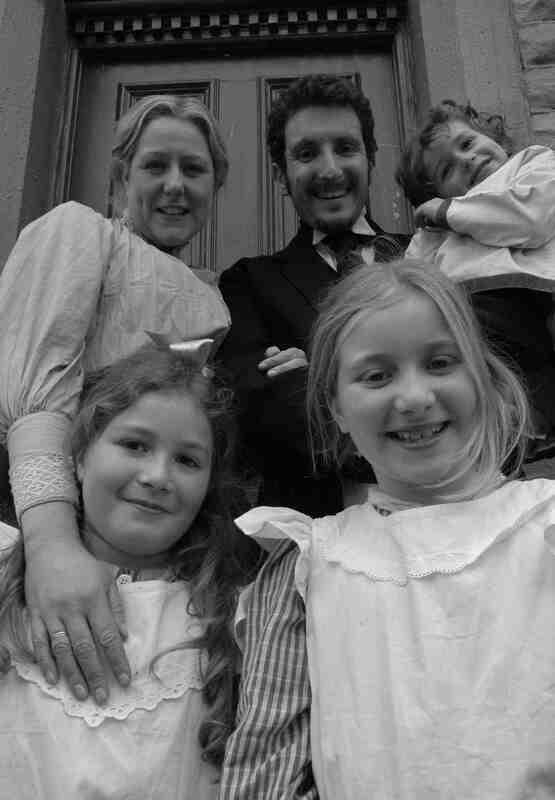 Me as a Middle Class Edwardian council clerk and my very well mannered wife and family! The debate on manners is one thing. The reaction of the Sainsbury’s checkout assistant is another. Reports in the media have seen many spring to her defence. Driven by the manners principle, it is argued that she was quite right to refuse to attend to someone who was actively disengaged in the transaction. Whilst I will repeat that I am not disagreeing with the manners principle, I do find myself on the side of the fence that says the checkout assistant was in the wrong to refuse to serve Jo Clarke. I believe that all employees should be empowered to do what is right for the customer. I believe that employees should be actively encouraged to do what it takes to make an experience positively memorable for customers. Only last week I was fortunate to judge the customer service training awards in London. Haven holidays told a great story of a guest who visited a Haven Park recently. The guest realised on arrival that they had forgotten to bring a travel cot for their baby. Haven did not have any spare. The receptionist took it upon herself to call her husband – asking him to bring their own travel cot so they could lend it to the guest for the week. That is what I call positive empowerment! I also believe that employees should not under any circumstances be subjected to inappropriate behaviour from a customer. Abusive, aggressive customers are not the kind of customers a business needs. It is on the rare occasion that a customer behaves inappropriately that I would agree that the customer is definitely NOT right. I do not believe that there is a sufficient argument to suggest that Jo Clarke was inappropriate. Although rude (in my opinion), she was neither abusive or aggressive. Her behaviour did not prevent the checkout assistant from doing her job. The checkout assistant also had no idea what the purpose of the call was. Jo Clarke could have been on the phone talking to the hospital about a sick relative. She could have been answering an important call from work, or listening to a message from school about an injury to her child. I do not believe it is within the rights of an employee to take it upon themselves to ‘discipline’ a customer when the customer has technically not done anything wrong in the eyes of the company. The fact that Sainsbury’s decided to apologise suggests that they agree. It would be a brave retailer that would make a decision to ban the use of mobile phones from the checkout of their stores. There is nothing to stop retailers or other organisations suggesting that the use of mobile phones at the checkout should be avoided, but they are unlikely to actively stop it. Like any debate, it is difficult to reach a conclusive result. There are as many people agreeing with Jo Clarke as there are with the checkout assistant. A discussion with the lovely Mrs Golding last week about this story resulted in a full blown argument. Naomi is in complete agreement with the checkout assistant. It is understandable as Naomi spent a year working for one of the big supermarkets. She has experienced first hand what it feels like to serve a customer who just expects you to get on with it whilst they merrily chat away on the phone. Naomi said it is extremely dispiriting and de-motivating. Naomi says it almost makes you feel like a worthless piece of furniture. This does help to understand the frustration of being on the other side of the till, and why the checkout assistant took the action she did. I still feel that it is for the company to make a decision as to what is acceptable and what is not. It is then the responsibility of the company to invest in training their staff on how to best deal with situations like this. I am pleased that Sainsbury’s apologised. I am also pleased that they are not taking any disciplinary action against the member of staff. Jo Clarke has suggested she will not shop in this Sainsbury’s again. Is that because she is mortally wounded by the experience, or because she is afraid of the disapproving looks she may get from other shoppers? Hopefully the experience has served as a reminder to her and others of basic manners. If so great. However, we should sadly resign ourselves to living in a world where social etiquette continues to ebb away at the same pace as technology continues to evolve. What side of the fence do you sit on? I would love to know.